Last week at the AMD Tech Summit in Sonoma, California, AMD provided an update on its upcoming Zen CPU architecture to select journalists. At the New Horizon event in Austin, Texas on Tuesday, AMD shared these details with the general public. Here’s everything we know so far about AMD’s upcoming CPUs. For starters, the Zen CPU architecture will come to market carrying the name Ryzen, with the first set of ‘Summit Ridge’ desktop CPUs now expected to ship in Q1 2017. Ryzen will be the culmination of a four-year effort by AMD to regain the market share and mindshare it has lost to Intel in the high-performance desktop market. Jim Anderson, Senior Vice President and GM, Computing and Graphics, believes that with PC gaming hardware sales growing thanks to VR and other use cases, the “market is right for a powerful new desktop processor”. AMD, of course, believes that Ryzen is the answer. Based on the new AMD AM4 platform, Ryzen desktop CPUs will have 8 cores (16 threads) clocked at 3.4GHz+ and 4MB of L2 cache as well as 16MB of L3 cache. 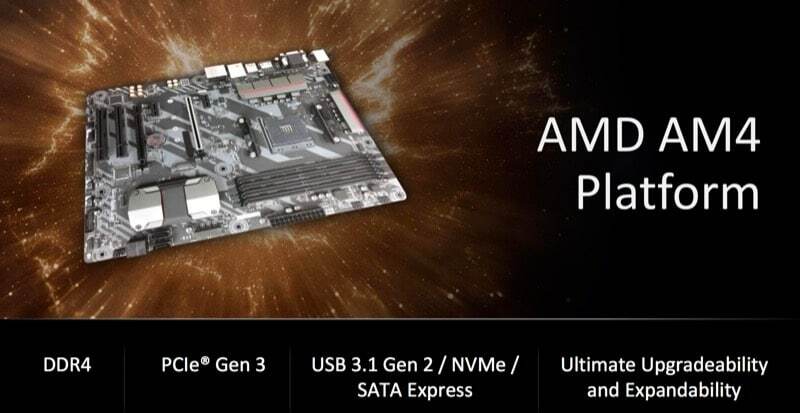 Details on the AM4 platform are scant except for the fact that it supports DDR4, PCIe Gen. 3, USB 3.1 Gen. 2, NVMe, and SATA Express technologies. One of the demos at the press event showcased a 'Summit Ridge' Ryzen CPU without any speed boost feature in a head-to-head battle against an Intel Core i7 6900K at 3.2GHz with Turbo Boost on. While the two finished the test in nearly identical times, AMD’s demos showed the Ryzen CPU using less power, with the company claiming it is on track to achieve its earlier claims of 40 percent more instructions per clock using the same amount of energy. The performance gains and the efficient energy use are attributed in part to the new AMD SenseMI technology. The five key features of this are: Pure Power, Precision Boost, Extended Frequency Range, Neural Net Prediction, and Smart Prefetch. Starting with Pure Power, at the heart of the CPU are a set of embedded sensors which allow for monitoring of temperature, speed, and voltage in real time. 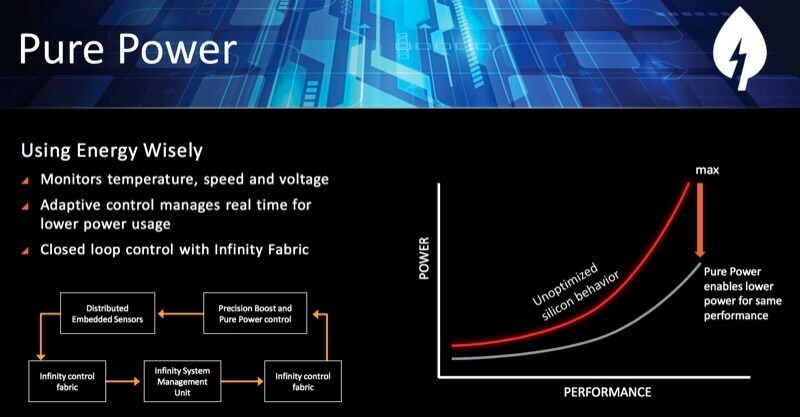 Coupled with Infinity Fabric, they allow for greater power efficiency than before. While AMD was silent of the inner workings of Infinity Fabric, we do know that it’s a protocol that makes this kind of monitoring, and other communication, within the SoC possible. Precision Boost allows for fine-grained frequency control, which means instead of the CPU operating at non-turbo and a higher frequency turbo speeds, it can now increase (or presumably, decrease) the frequency in 25MHz increments, allowing for greater power efficiency. Extended Frequency Range will please enthusiasts as it permits frequencies above and beyond ordinary Precision Boost limits, with exact clock speeds scaling with the cooling solution used. Best of all, it will be fully automated with no user intervention required. Neural Net Prediction will let the CPU anticipate future decisions, preload instructions, and choose the best path through the CPU, further increasing overall efficiency. Smart Prefetch will let Ryzen CPUs anticipate the location of future data accesses by application code and then prefetch vital data into a local cache so it’s ready for immediate use. As stated earlier, the desktop-grade ‘Summit Ridge’ AMD Ryzen CPUs will ship in Q1 2017, with ‘Naples’ chips for serves due to arrive in Q2 2017. ‘Raven Ridge’ chips suitable for use in notebooks will be available in the second half of next year. AMD President and CEO Dr. Lisa Su believes Ryzen will give AMD the “best product stack we've had in a decade”, and it’s safe to say the company has a lot riding on it. Disclosure: AMD sponsored the correspondent’s hotel for the press event in Sonoma, California.